Where do asteroids come from? The asteroid belt is a ring shaped area, located between the orbits of Mars and Jupiter that contains more than 5,000 asteroids. Asteroids are minor planets that are smaller than what we typically call a planet, but larger than what we call meteoroids. Only a few of them are large and have a spherical shape. The rest look like irregular shaped rocks with cratered surfaces. In order to observe asteroids you will need a telescope and a good star chart. Since they look exactly like stars, you should be patient and observe them for a few nights in a row. If the object moves with respect to the stars you probably have found an asteroid. However, if you have a motorized mount mechanism on your telescope and photograph the sky for few hours, the stars would be like dots on your pictures, while asteroids would look like short streaks. Why do we need to study asteroids if they are so small? They can give valuable information about the material that formed our Solar System and some of them could strike the Earth, possibly killing life! Ceres, the largest asteroid with a diameter of about 580 miles, was discovered in 1801 by Giuseppe Piazzi and named after the Roman goddess of the harvest, growing plants, and motherly love. 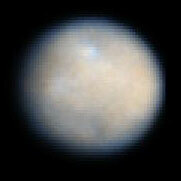 The next year, Heinrich Olbers discovered Pallas, named after Pallas Athena, the Greek goddess of wisdom. 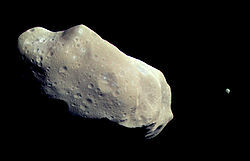 A few years later, Olbers also found another asteroid and named it Vesta, for the ancient Roman goddess of the hearth. Asteroid hunting continues today. Asteroids are classified by their brightness, chemical composition and position in the solar system. Some asteroids look dark, since they reflect only a small percentage of sunlight, while others reflect more and look brighter. Their brightness is determined mainly by the chemical composition. About 75% of asteroids contain high amounts of carbon. These high carbon asteroids are classified as C-type asteroids. About 17% of asteroids are formed from silicate material and iron, which makes them brighter. These silicate rich asteroids are called S-type asteroids. M-type asteroids, containing mostly metals are rare, and probably were formed in the nuclei of other bodies. Asteroids are divided in several groups according to their location in the solar system. For example, Trojans share the same orbit as Jupiter, while Near Earth objects cross the Earth's Orbit. When an asteroid, comet fragment, or other small body --commonly called a meteoroid-- enters the Earth's atmosphere, it produces a spectacular sight called a meteor or shooting star. Friction with the air molecules heats, melts, and typically burns the meteoroid while it is still high in the atmosphere. However, if the body is large enough, it can reach the surface. Astronomers called these chunks meteorites. Meteorites might be pieces of comets or planets, but the majority of them are parts of asteroids. Scientists study them determining their chemical composition and structure to learn more about the material that formed our Solar System. Asteroids were first studied in depth by the Galileo spacecraft on its way to Jupiter. This mission revealed that the asteroids Ida and Gaspra are small bodies with irregular shapes and heavily cratered surfaces. The NEAR spacecraft was a project designated to study the asteroid Eros, which is one of the largest asteroids that comes close to the Earth. NEAR took thousands of pictures and measured the asteroid's shape precisely using a laser rangefinder. While the magnetometer did not register any magnetic field, the x-ray and gamma-ray spectrometers were successfully used to measure chemical composition. Near Earth Objects (NEOs) are objects (primarily asteroids and comets) whose orbits cross the Earth's. They are very interesting and challenging at the same time. Their small sizes make early detection very difficult. However, if they are close enough and their orbits line up with the Earth they could be very dangerous. Statistics show that about every 100 years the Earth is hit by a small asteroid. A significantly large one (about 1 mile in diameter) hits the Earth about once every million years. However, one 19-mile asteroid probably led to the extinction of the dinosaurs 65 million years ago. It hit Central America with such force that it caused global climate change resulting in the deaths of the dinosaurs and many other species. 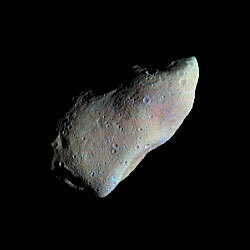 The asteroid 243 Ida was the first one found to have a natural satellite, called Dactyl. Analysis of Galileo's images show that Ida has a potato shape. It is 58 km long and 23 km, wide with many craters. Dactyl was found about 90 km away from Ida. It has an egg shape with dimensions of 1.2 x 1.4 x 1.6 km. Every year millions of tons of rock and dust fall on the Earth from space. However, most of the material burns up in the atmosphere or falls in the water basins. In addition, the combined actions of the atmosphere and erosion have erased most of the craters formed from impacts. NEAR is the first spacecraft that landed on an asteroid. During the first attempt in 2001, it missed the asteroid Eros. However, the engineers fixed the problem and NEAR entered in orbit around Eros a year later. It spent another year studying and photographing the asteroid. The only dwarf planet in the inner Solar System, with a diameter of 950 kilometers, and the largest object found in the asteroid belt, between the orbits of Mars and Jupiter. It was discovered in 1801 by the Italian astronomer and priest, Giuseppe Piazzi. 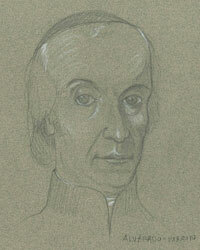 German astronomer and physician, best known for his discovery of the asteroids Pallas, in 1802, and Vesta, in 1807. 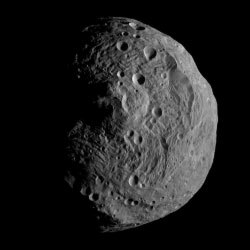 Discovered in 1802 by Heinrich Wilhelm Olbers, Pallas is one of the largest asteroids in the asteroid belt. The second largest asteroid in the Solar System, it has a size of 578 x 560 x 458 kilometers. A common rocky material containing silicon, oxygen and one or more metals; the primary component of Earth's crust, as well as the crust of Mercury, Venus, Mars and some types of asteroids. A metal and the most common element on Earth. Launched in 1989, Galileo was a spacecraft tasked with the mission of studying Jupiter and its moons. 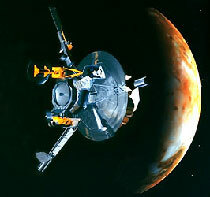 In 2003, the mission was ended and Galileo was purposely hurled into Jupiter's atmosphere. An S-type asteroid found in the asteroid belt, Ida was the first asteroid to be found with a satellite (Dactyl) orbiting it. Also known as 951 Gaspra, it is an S-Type (stony) asteroid orbiting within the confines of the asteroid belt. It measures 18.2 x 10.5 x 8.9 kilometers. The Near Earth Asteroid Rendezvous, launched in 1996 by NASA, is a space probe designed to study the asteroid Eros. Even though NEAR was never intended to be a lander, in early 2001 the probe was commanded to land on Eros's surface, which was possible in part due to the low gravity of the asteroid. An S-type (stony) asteroid discovered in 1898. It measures 34.4 x 11.2 x 11.2 in size.